The close of the year provides that one precious opportunity to look back before looking forward. It’s a time to reflect on what we did this past year. Was it much different than the year before? Or, the year before that? If you’re like most people, the answer is no. Why not? We begin the New Year with a clean slate, a fresh start. Trouble is, our minds are anchored in the past. We’re tethered to the current tactics, most recent budget and outdated strategies. And because our thinking doesn’t change, neither does our behavior. We’re performing the same activities in the same way year after year. A really smart guy once labeled that insanity. A manager, by the very definition of the term, is someone who has control of and responsibility for the direction of their business. An important but often neglected part of this responsibility is to disengage from offerings, markets and customers that are no longer providing value and profits to the organization. During his tenure as CEO of Exxon Mobil, Lee Raymond had a requirement that 3-5% of the company’s assets be identified for disengagement every year.Having this type of requirement in place can reawaken people’s mindset and discipline to make real trade-offs. In my experience providing strategic counsel to senior leaders around the world, there are two types of disengagement: active and passive. Active engagement involves reviewing areas of resource allocation on a monthly basis and jettisoning activities, projects, reports and tactics that are either are not working or not providing value. Research with 200 large organizations has shown that the number one driver of revenue growth is the reallocation of resources from underperforming initiatives to one’s with greater promise. However, because strategy is an annual event in most organizations and not an ongoing dialogue of key business issues, passive disengagement is much more common. In passive disengagement, managers tend to wait for planning season to arrive to make changes. And typically, the changes they make aren’t significant enough to make a difference. A study of more than 1,500 companies over a 15-year period showed that a full one-third of businesses received almost exactly the amount of capital in a given year as they did the year before. 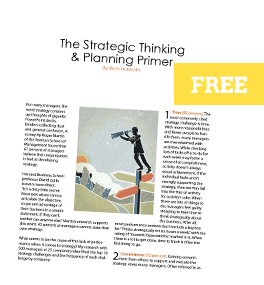 Are all the hours your team invests in the strategic planning process resulting in significant changes in resource allocation? For most leaders, there are changes in their market, changes in customer value drivers and changes in the competitive landscape from year to year. Yet, the areas they allocate resources to and the corresponding amounts see little, if any, change. Unless you as a leader are involved in active disengagement on a regular basis, you are most likely wasting a significant portion of your people’s time and budget. As Twitter co-founder Evan Williams said, “When I meet with the founders of a new company, my advice is almost always, ‘Do fewer things.’ The vast majority of things are distractions and very few really matter to your success.”The discipline to do fewer things–to focus–begins with your ability to disengage. 1. What should I stop doing next year? 2. What should I do less of next year? 3. What should I do more of next year? 4. What should I start doing that I haven’t done in the past? 5. How will I change my behaviors? Human beings don’t like to change. At work, this results in the organizational lobotomy. People stop thinking because they’re too busy acting and reacting without reflecting on what they’re really trying to achieve. Are all of the things you’re investing time, talent and budget into truly helping you achieve your goals? If you need more time then have the discipline and guts to create it by disengaging in less productive activities, initiatives, and yes, teleconferences! Will some people internally be upset by that disengagement? Yes. Get over it. Good strategy demands trade-offs, which means you can’t be all things to all people internally. If your organization values performance over popularity contests, then you will position yourself to win more of your external customer’s business. And at the end of the day, at the end of the year, anything else is insanity.